Oyster chef extraordinaire Christophe Happillon has opened The Oyster Gourmet at the Grand Central Market in downtown L.A. Expect oysters paired with wines, and also mussels, scallops, clams and sea urchin. The Oyster Gourmet, Grand Central Market, 317 S. Broadway Ave., Los Angeles, CA 90013, 213-624-2378. A menu of wood-fire grilled and roasted fare arrives November 1, 2014 with the opening of Cadet. Kris Tominaga (The Hart & the Hunter), is behind this homage to rural French dining. Tartines run the gamut from a light combo of delicata squash with pecans and baby kale to the richness of beef tartare with marrow butter, Roquefort, smoked oil and chive. Other offerings from Cadet’s centerpiece wood-fired grill include pork collar, rib eye steak and an array of seafood, served in a cozy setting with both indoor and outdoor seating. The bar will feature an extensive selection of wine, beer and craft cocktails. Open daily for dinner. Cadet, 2518 Wilshire Blvd., Santa Monica, CA 90403, 310-828-3300. Modern American supper club Ocean Prime has opened its 11th location, at the apex of Wilshire Boulevard, Dayton Way and Camden Drive in Beverly Hills. The menu features signature items including ahi tuna tartare, Oscar-style filet mignon and Chilean sea bass, alongside hand-rolled sushi. Spanning 11,400 square feet, including a sprawling terrace, the space seats 350 guests and features three private dining rooms. The lounge and bar offer craft cocktails and higher-end wines. Lunch Mon.-Fri., Dinner nightly. Ocean Prime, 9595 Wilshire Blvd., Beverly Hills, CA 90212, 310-859-4818. Ice-Cream Lab opened a second location in Pasadena. This molecular ice cream shop, which started in Beverly Hills, presents made-to-order liquid nitrogen ice cream containing organic, kosher and locally sourced ingredients. 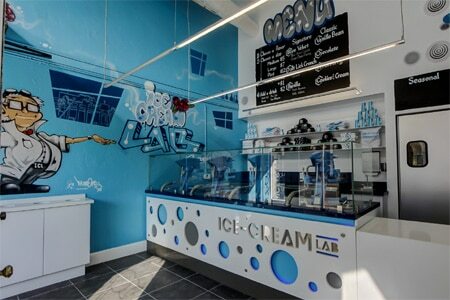 Ice-Cream Lab, 16 S. Fair Oaks Ave., Pasadena, CA 91105, 626-808-4874. Chef Akira Back's Yellowtail Japanese Restaurant & Lounge has opened on the Sunset Strip. This is the second location for the concept; the first Yellowtail Japanese Restaurant & Lounge is at the Bellagio in Las Vegas. 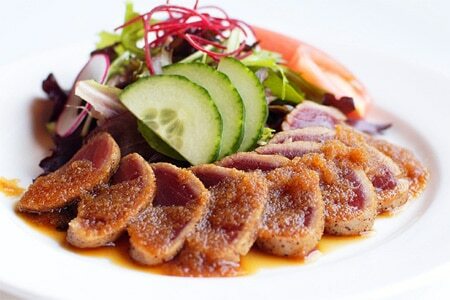 Yellowtail Japanese Restaurant & Lounge, 8768 W.Sunset Blvd., West Hollywood, CA 90069, 310-360-0366. Chef David LeFevre and the Simms Restaurant Group (Simmzy's, Tin Roof Bistro) will open The Arthur J in the former Circa space in Manhattan Beach in mid-2015. This will be their third collaboration, following MB Post and Fishing With Dynamite. The Arthur J, 903 Manhattan Ave., Manhattan Beach, CA 90266, No phone. In the former India's Oven space, Cardamom presents a menu of contemporary Indian cuisine with dishes representing every region of the country. Cardamom, 7233 Beverly Blvd., Los Angeles, CA 90038, 323-936-1000. Blu Jam Café has opened its third outpost in Woodland Hills. The Melrose flagship is known for its popular all-day breakfasts and brunches, vegan and vegetarian specials, and long waits on weekends. Expect the same menu, which features a long list of pancakes, French toast, eggs, generous salads, sandwiches, burgers and house-roasted coffee. Breakfast & Lunch daily. Blu Jam Café, 23311 Mulholland Dr., Woodland Hills, CA 91364, 818-222-1044. Tender Greens is now open in DTLA in the PacMutual Building, adjacent to Pershing Square. The 1,000-square-foot restaurant offers indoor and outdoor dining in a restored historic courtyard that was originally created in 1921. This will be the first location to feature a pick-up window for to-go orders, catering and grab-and-go specials. Executive chef Adolfo Nicasio (Fraiche, Angelini Osteria) incorporates Italian and American influences in the restaurant’s trademark local, sustainable fare and daily specials. Dishes include heirloom gazpacho, a prosciutto sandwich, and a falafel salad with little gem lettuce and yogurt dressing. Beverages feature housemade agua frescas, Stumptown Coffee, boutique wines and craft beer. Lunch & Dinner daily. Tender Greens, PacMutual Building, 523 West Sixth St., Los Angeles, CA 90014, 213-873-1890. Plan Check Kitchen + Bar has opened its third location in the Wilshire corridor of downtown’s City West district. Executive chef Ernesto Uchimura’s gastropub menu includes signature dishes like the Plan Check burger and and fried chicken, but also includes new items that pay homage to nearby Koreatown and East L.A., with a K-BBQ Burger (Gruyére cheese with kimchi, grilled pork belly, fried onions and sprouting onion.) There’s also a large happy hour menu (available from 4 p.m.-6 p.m.) with discounted drinks and new menu items like baked oysters Rockefeller, bacon and pimento grilled cheese, fries with schmaltz onions, and chicken wings. The bar program includes 12 craft beers, a curated wine list, seasonal cocktails, and an extensive list of bourbons, Japanese whiskies and single malts. Lunch & Dinner daily. 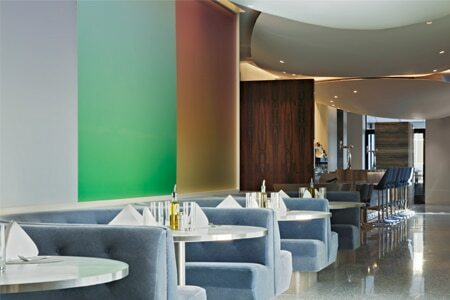 Plan Check Kitchen + Bar, 1111 Wilshire Blvd., Los Angeles, CA 90017, 213-403-1616. Mercado has opened a third location. The contemporary Mexican menu features tamales, slow-cooked carnitas and jumbo scallops crusted with pumpkin seeds, along with specials unique to this outpost. Mercado, 3413 Cahuenga Blvd. W., Los Angeles, CA 90068, 323-512-2500. After shuttering BierBeisl in Beverly Hills, chef Bernhard Mairinger will open BierBeisl Imbiss in the Spring Arcade Building in downtown Los Angeles on July 9, 2015. The concept will be modern Austrian street food. BierBeisl Imbiss, Spring Arcade Building, 541 S. Spring St., Los Angeles, CA 90013, 213-935-8035. Bowery Bungalow, the latest restaurant from George Abou-Daoud (The Bowery, Delancey, etc. ), features farm-to-table cuisine inspired by the flavors of the Middle East. Bowery Bungalow, 4156 Santa Monica Blvd., Los Angeles, CA 90029, 323-663-1500. In Malibu Tra Di Noi owner Antonio Alessi has opened an Italian countryside eatery, Mangia, serving wood-fired pizzas, casual Italian fare, wine and cocktails. 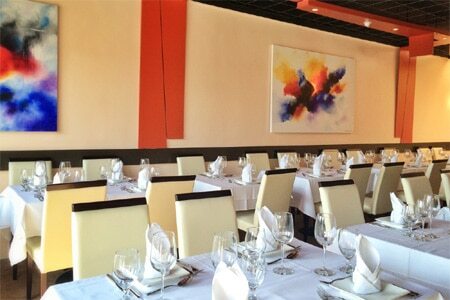 Mangia, 30745 Pacific Coast Highway, Malibu, CA 90265, 310-457-4500. Restaurateur Jonathan Chu (Buddha’s Belly, Copa d’Oro) and mixologist Vincenzo Marianella (Copa d’Oro, Providence) have enlisted Chef David Bartnes (b.o.s.) and General Manager Tatia Oshidari (Orris) to establish The Independence, a modern tavern in Santa Monica’s former Buddha’s Belly space. The neighborhood restaurant and bar will feature market-driven food and cocktails. The Independence, 205 Broadway Ave., Santa Monica, CA 90401, 310-458-2500. Replacing the former Barney Greengrass atop Barneys New York in Beverly Hills is Freds. Chef Mark Straussman tips his toque to the former haunt with New York classics like matzo ball soup and a fine list of smoked fish options ranging from nova to sturgeon and whitefish (flown in from NYC and served with bagel, eggs or appetizer). The Cali side of the menu kicks in with an ahi tuna spinach wrap, salmon burger, quinoa salad, truffle fries and breakfast burrito. Cocktails include an Apricot Julep, and there’s plenty of bubbly by the glass or bottle. Lunch & Dinner daily, Brunch Sat.-Sun. Freds, Barney's New York, 9570 Wilshire Blvd., Beverly Hills, CA 90212, 310-777-5877. Japan’s popular curry house franchise CoCo Ichibanya, which has more than 1,400 locations worldwide, has opened another L.A. location in Koreatown in the City Center Plaza. Expect house specialty spicy curry donkatsu with chicken, pork and seafood, omelet with curry, fried chicken salad, and tropical fruit milk shakes. Lunch & Dinner daily. CoCo Ichibanya, City Center Plaza, 3500 W. 6th Street, #110, Los Angeles, CA 90020, no phone. Kelly Chapman’s popular food truck has become a brick-and-mortar spot in Valley Village, Mac-O-licious, serving up a panoply of gourmet mac and cheese. Pick from 10 versions ranging from signature Southern mac to Maine mac (cheddar and Gruyère cheeses melted over Maine lobster) and bacon mac casserole. There’s even a gluten-free rice noodle variety. Also, find orange mango salad, lobser bisque, corn and squash chowder, barbecue chicken, and red velvet cake. Lunch & Dinner Tues.-Sat, Brunch Sun. Mac-O-Licious, 5217 Laurel Canyon Blvd., Valley Village, CA 91607, 818-814-6220. Chef Akasha Richmond (Akasha) has taken over the former Ford’s Filling Station space in Culver City and plans to open a modern Cal-Indian restaurant, tentatively called Spice Box Kitchen, in 2015. Spice Box Kitchen, 9531 Culver Blvd., Culver City, CA 90232, no phone. During Hungry for Tokyo, a month-long dining promotion in November, 21 Los Angeles area restaurants will feature special Tokyo-themed menu items. Guests who order from the Hungry for Tokyo menu will receive a copy of the “Tokyo Gourmet Guide,” a booklet on destinations for foodies in Tokyo. Participating restaurants include Shunji Japanese Cuisine, Superba Snack Bar, and The Izaka-Ya By Katsu-ya. In Studio City, Phillip Frankland Lee’s hip and happening vegan/vegetarian restaurant, The Gadarene Swine, has added lunch service. Expect salads, inventive vegetable dishes and a prix fixe menu. 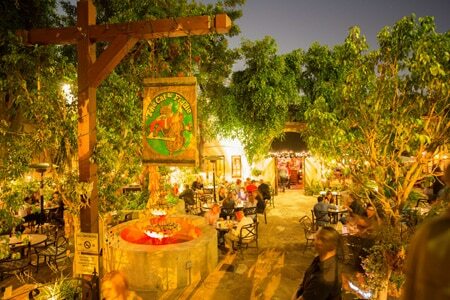 The Gadarene Swine, 11266 Ventura Blvd., Studio City, CA 91604, 818-508-5500. Tortilla Republic in West Hollywood has launched two new lunch menus, “Short N’ Sweet” and “Relax & Rita.” The Short N’ Sweet ($15) option offers a salsa trio or guacamole followed by a main course, such as the quesadilla de hongos with cremini and oyster mushrooms, roasted shallots, baby arugula, Monterey jack, Manchego cheese and white truffle oil. The restaurant guarantees to provide the Short N’ Sweet menu to guests within 15 minutes, from the time they order, for up to four people. If this timing is not met, lunch will be complimentary. The Relax & Rita ($24) menu features a house or jalapeño Margarita, a salsa trio or guacamole, and any lunch entrée from the traditional menu. Tortilla Republic, 616 N. Robertson Blvd., West Hollywood, CA 90069, 310-657-9888. Hakkasan is celebrating the annual Chinese holiday Golden Week from Sept. 29-Oct. 12, 2014, with a chef’s menu created by international development chef Ho Chee Boon. Priced at $138 per person, the menu includes Peking duck with caviar; a dim sum platter; spicy Szechuan rib-eye beef with enoki mushroom; roasted crispy chicken with wild mushroom in oyster sauce; fried rice with diced abalone; and deep-fried black sesame and chocolate dumplings with ginger and yuzu tea. 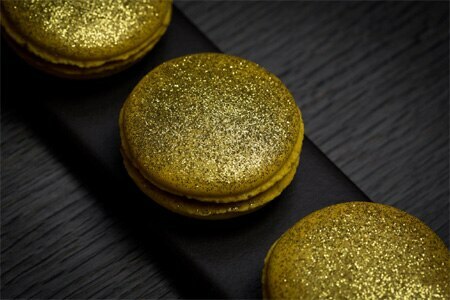 A box containing hand-made golden macarons will be given at the end of the meal to each guest to take home as a gift. Hakkasan, 233 N. Beverly Dr., Beverly Hills, CA 90210, 310-888-8661. Charles Olalia, formerly of Patina, is now chef de cuisine at Terranea Resort's signature restaurant mar'sel. mar'sel, Terranea Resort, 100 Terranea Way, Rancho Palos Verdes, CA 90275, 310-265-2701. Chef Ray Garcia has handed over the reins of FIG at Fairmont Miramar Hotel & Bungalows to Yousef Ghalaini, most recently of The Bench at The Lodge at Pebble Beach. FIG, Fairmont Miramar Hotel & Bungalows, 101 Wilshire Blvd., Santa Monica, CA 90401, 310-319-3111. Circa, a project from restaurateur/entrepreneur Michael Zislis (The Strand House, Shade Hotel, ROCK'N FISH, Rock & Brews) has shuttered. Circa, 903 Manhattan Ave., Manhattan Beach, CA 90266, no phone. The Sunset Strip’s sidewalk bistro Le Clafoutis, a favorite of West Hollywood for more than two decades, has closed. There’s no word yet on a new concept in the space. Clafoutis, Sunset Plaza, 8630 W. Sunset Blvd., West Hollywood, CA 90069, no phone. The Korean barbecue restaurant Star King has closed. Star King, 3807 Wilshire Blvd., Ste. 120, Los Angeles, CA 90010, no phone. Hollywood's beloved watering hole The Cat & Fiddle is closing after December 15, 2014. The restaurant's lease has reportedly not been renewed. The Cat & Fiddle, 6530 Sunset Blvd., Hollywood, CA 90028, 323-468-3800. Stefan's at LA Farm, which was opened by "Top Chef" contestant Stefan Richter, has been replaced by The Roost at LA Farm, featuring a seasonal American menu from chef John Keenan. Stefan's at LA Farm, 3000 Olympic Blvd., Santa Monica, CA 90404, no phone. In Beverly Hills, the iconic New York-style deli Barney Greengrass has closed to make way for a new restaurant concept atop Barney’s department store. Barney Greengrass, Barneys New York, 9570 Wilshire Blvd., Beverly Hills, CA 90212, no phone. Italian trattoria Girasole in Larchmont Village has closed. It will re-open as Vernetti. Girasole, 225 1/2 N. Larchmont Blvd., Los Angeles, CA 90004, no phone. The Palm in West Hollywood closed its doors on September 30, 2014, after nearly 40 years in business. The steakhouse chain opened a new location of The Palm in Beverly Hills at 267 North Canon Drive in November 2014. The Palm, 9001 Santa Monica Blvd., West Hollywood, CA 90069, no phone.